Founded in 2008, St. Johns Data Consulting, LLC (SJDC) provides digital forensic analysis, consulting, training, and expert testimony in support of litigation. We strive to bring our clients the most secure, professional, confidential, and competent assistance to support various types of litigation. We specialize in the proper recovery, preservation, validation, and presentation of data relevant in civil litigation cases, including: Intellectual property disputes, intellectual property theft, contract violations, employment matters, non-compete, non-disclosure, insurance, fraud, and divorce. 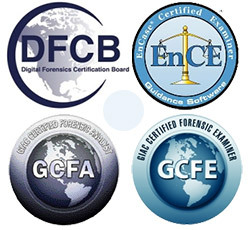 Our principal consultant, Michael Antal, PhD, is a court qualified expert, and certified in digital forensics. Dr. Antal is a member of various digital forensic professional organizations, regularly attends advanced training to maintain proficiency, and has years of education and experience in many aspects of digital forensics, training, and research. Click here to download a copy of Dr. Antal’s vitae or visit LinkedIn to see more of Dr. Antal’s qualifications. Allow us to answer your questions regarding digital forensics, or any of the services we provide.